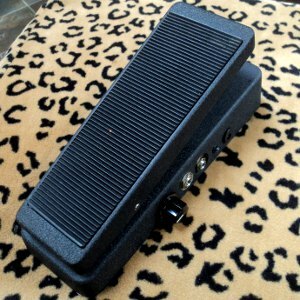 Same circuitry as the Blender V1 but in an expression pedal shell. The foot treadle controls the blend in that 50/50 effects/clean is right in the middle, in the toe down position it's all effects and in the heel down position it's all clean. We can also switch it so that heel down is all effects and toe down is all clean. The true bypass switch is activated by pushing down at the toe down position. On the sides there is a knob for the output volume of the blended signal and a toggle switch to flip the phase of the return of the effects loop.